Muffle Furnace India, Muffle Furnace Manufacturer, Muffle Furnace Suppliers & Muffle Furnace Exporters in India. 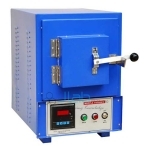 JLab is renowned Exporters & Manufacturer of Muffle Furnace & Scientific Lab Instruments India, Muffle Furnace Exporters, Muffle Furnace Suppliers India. Operation Temperature:- 1100.C ( 1200.C Max for short time). Maximum energy efficiency is achieved by surrounding the chamber with thermal-efficient alumina fiber ceramic insulation. Based on the rotating disc-splash plate principal. Unit produces only super fine particles of micron size, which become part of the atmosphere.